Developed by a small team of fans from Argentina, Golden Axe Myth is a fan-made prequel runs on the open-source Beats of Rage engine, the foundation of many homebrew beat-em-ups. 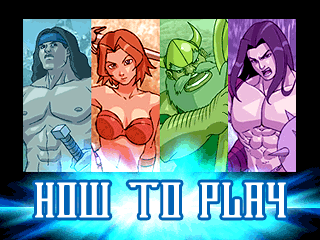 There have been other fan-made Golden Axe games using the engine, but this is the only one to feature totally original art. In addition to the usual three heroes from the arcade game, you can also play as Death Adder, before his transformation. He’s slow, wields a huge mace, and casts dark magic. There’s quite a lot of content here – there are brief story scenes, branching paths, bonus unlockable characters and hidden areas. In addition to magic jars, you can also obtain symbols to increase your strength or defense, and money to purchase items in the few areas that have shops. The mechanics have been expanded to allow vertical rolls, blocking, and additional special movies. 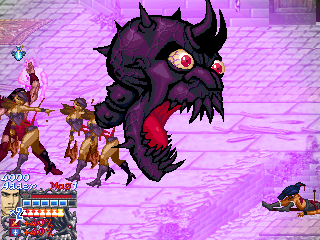 After beating up enough enemies, you can also activate “Rage Mode”, which increases your damage. Maybe it has something to do with the huge range of your attacks, or the cheesy blood splatters, or just the way the enemies react, but the gameplay doesn’t feel much like Golden Axe. This is hardly a huge sin, considering Golden Axe III didn’t even feel much like Golden Axe, but it’s a constant reminder that this was built using a general purpose beat-em-up tool. The visuals more closely resemble a late SNK release, like The King of Fighters, rather than the original arcade games. They’re much brighter and draw more from manga than Conan the Barbarian, even more so than Golden Axe The Duel – who knew Death Adder was secretly a long haired bishounen? 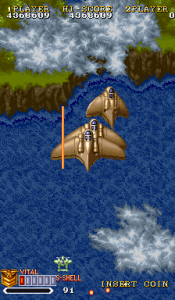 The music mostly consists of remixes of old songs, many of which are decent, though their modern sound doesn’t quite instill the same atmosphere as the original games. 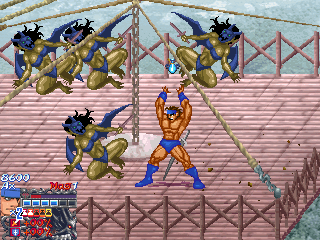 Due to the change in style and mechanics, Golden Axe Myth definitely feels like a fan game. Still, a decent effort. Sega Superstars Tennis, released in 2008 for the Wii, PlayStation 3, Xbox 360, PlayStation 2, and NDS, features a number of Sega characters taking it to the tennis courts. In addition to the Sonic characters, most of the roster comes from Dreamcast era games like Samba de Amigo, Space Channel 5 and Jet Grind Radio. However, they also have a couple of true classic Sega characters, like Alex Kidd and Gilius Thunderhead. Gilius looks like he’s grown a bit of a beer belly and his character model isn’t quite up to par with the other characters. Although there’s technically a Golden Axe stage, it strangely takes place in the House of the Dead court, and there’s no Golden Axe court at all. 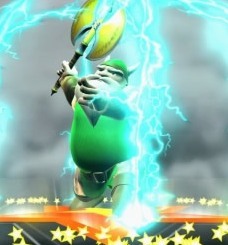 For his special move, Gilius summons lightning to confuse his opponents. His tennis racket also temporarily turns into the Golden Axe. When you unlock him in the 360 version, the accompanying text reads “His brother was killed by Death Adder!”, acknowledging his roots in a rather amusing way.